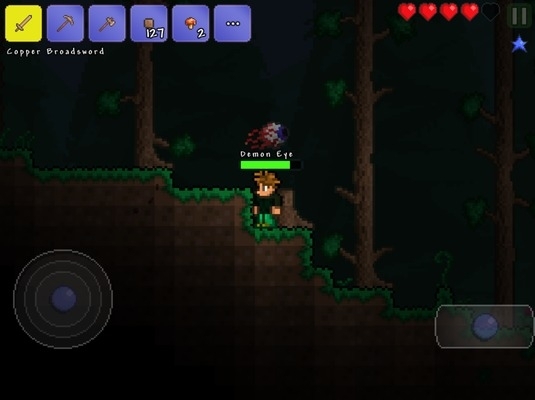 Terraria is one of the best Minecraft inspired games we've seen on mobile, as you can tell from our review. That said, it's easy to get overwhelmed by the sheer number of options at one's disposal and dangers appearing at night. With this in mind, here are some tips to get you started. -Grow accustomed to mining, first and foremost, because this is a great way to acquire resources. Use the mining axe and dig around for a number of high-quality ores, including iron, copper and gold. These are the strongest in the game, and will help you build things with ease. -Don't forget about basic resources. Use your pickaxe, cut down trees and collect wood. This will help you build your first house, which you'll need to complete before nightfall. That is, unless you like running around fighting demons out in the open. -There is an Underworld beneath the main world with plenty of resources available, but it'll take time to reach it. Best way to get there? Continue digging straight down. You'll create a Hellevator, which lets you quickly reach the Underworld. Before you dig, however, try and make some Glow sticks, so you can see what you're doing. -When it comes to building a structure for your safety, keep a few things in mind. You'll want a lock for the door, which you can set up with a block on the inside or outside of the door. This is vitally important during the Blood Moon nights, when enemies are stronger than usual. -Set up homes as deep in the ground as possible. Dig a big pit to create the foundation, then build around it. Don't be afraid to expand. The more room you have to run, the better off you are. -Keep monster height in mind. Build entryways small enough that your character can get through, with enough space to attack enemies. If the doorway is low enough, they'll be stuck outside - except during Blood Moon events - and you can take them down. -Watch out for danger when digging. Above-ground enemies can be vicious, but you'll find baddies beneath the surface, including large earthworms. Keep a weapon handy, dispose of them as quickly and continue the dig. -Finally, remember to keep building. 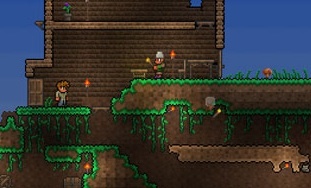 Terraria is a wide-open game where you can build some great stuff if you have the right resources and know-how, including new weapons like the boomerangs and the Star Cannon, and more powerful ore materials to make a better structure. Don't rely on the basics - let your imagination run wild.